Sweeten your laundry! 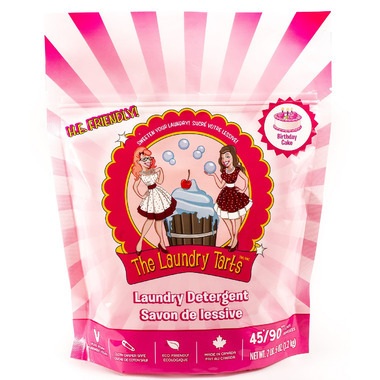 ​While many commercial brands use harsh fragrances to give the illusion of cleanliness, The Laundry Tarts laundry detergents only use safe old fashion ingredients to remove stains, keep whites bright and remove odour and bacteria without masking them with harmful chemical fragrances. HE friendly and formulated for hard and soft water. Directions for Top Loaders: For small loads use 2 tbsp. For medium to large loads, use 4 tbsp. For heavy or stubborn stains, soak for 1 hr or make a paste with water and scrub lightly with natural bristle scrubbing pad. Directions for H.E. Machines & Front Loaders: Energy efficient machines use 1/3 less water than traditional top loaders making them better for the environment by saving water and less energy. Less water means less soap. Use 1 tbsp for small loads and 2 tbsp for med-large loads. If needed, dissolve detergent in ¼ cup of warm water for machines requiring liquid detergents. Caution: Do not overload your machine with heavily soiled items; doing so may require an additional rinse for proper soap and water dispersal. I LOVE THIS COMPANY and their eco and vegan products. The smell of this detergent doesn't get baked in to your clothes, but for us what matters most are the ethics of the company. Their values are what we pay for and any residual smell is just a bonus. I love this stuff!! I'm sensitive to a lot of scents and most commercial laundry detergents. I love the fact that this is an all natural Canadian company that offers lightly scented, eco friendly and vegan choices. My first load of clothes smelt clean and true to thier word, no smell lingered after the wash wash done. I use this primary on cloth pads, towels and washcloths so far. No irritation at all! Very disappointing. Made absolutely NO difference in the smell of my clothes. It works well. It smells like cake. It's really awesome to get into bed and just smell cake. If you get the oil for the dryer balls, it's even better. I use if for my family (no babies anymore) and I have very sensitive skin and have experienced no issues. Smelling like cake is good for you but those around you as well. Lovely product and works great too! We use this brand for cloth diapers and it has always worked very well! Cleans clothes well without of the extra chemicals. I'm allergic to Tide, so I thought I would try Laundry Tarts, I was not disappointed. The scent isn't over-bearing and you just need to use a teaspoon at a time.